Earlier this week, it was reported that Donald Trump had called the White House “a real dump”—a remark that many latched onto as evidence that the man who prefers to live inside a 24-karat gold mausoleum surrounded by naked cherubs is somehow lacking in taste or humility, or that Donald Trump may be careless with his words. Fortunately, we now know that this was yet another smear, perpetuated by the failing liberal golf media whose dismantling cannot come swiftly enough. 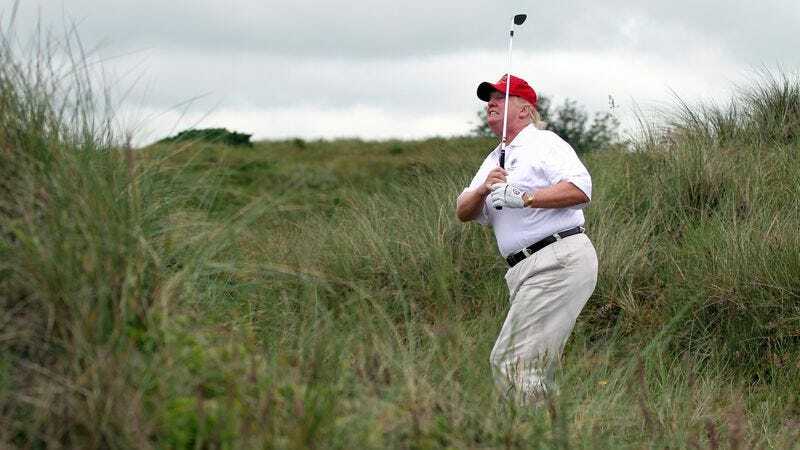 The rejoinder was aimed squarely at the partisan hacks of Golf Magazine, whose Alan Shipnuck concocted the piece as part of the continued, Soros-backed witch hunt into the President’s golf game. Though there were many scurrilous lies to be found within, including the TOTALLY UNTRUE accusation that Trump takes a lot of mulligans and is “portly,” the quote that got all the attention was the President’s alleged comment about the White House—the historic neoclassical mansion that is among the finest buildings-within-the-subcategory-of-personal-homes Trump has ever seen. Fortunately, it was fake. It was all fake, as is everything the desperate golf media tries to spin. They were wrong about using your wedge to flop it instead of doing a short and sweet 8-iron bump-and-run, just like they were wrong about Trump not being able to get to 306 electoral votes. Golf Magazine absolutely failed to predict Trump’s victory, so why should anyone believe them ever again? Sure, maybe Donald Trump doesn’t realize that the the presidency carries with it certain expectations of decorum and an enormous level of international scrutiny, and he should be more careful about expressing himself extemporaneously lest his words be construed as some sort of arrogant disregard for the responsibilities of the office. Or maybe it’s the lying fake news golf media who are always out to get him.